for construction, fences and other industrial uses. 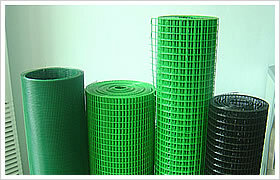 In construction in the form of reinforcement brick mesh, welded bar gratings or wire mesh sandwich construction. A wire mesh sandwich construction which comprises an array of line wires, an array of cross wires overlying said array of line wires and a barrier material disposed between the array of line wires and the array of cross welded wires. The array of line wires is joined to said array of cross wires at the points of intersection and through the barrier material, thus securing the barrier material between the array of line wires and the array of cross wires.